An incredible package for the independent retailer, the CK-30 has everything you want in retail price computing scales. 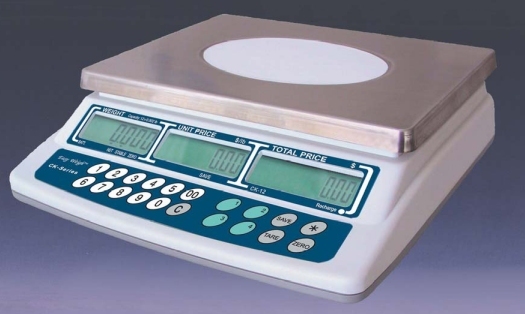 Offering a large weighing surface and phenomenal functionality, these scales are designed to meet the needs of your business. The CK-30 is a great tool for the sale of commodities in stores such as supermarkets, delis and grocery stores. Portable and sturdy, our scale features an AC adapter and built-in rechargeable battery with an auto power-off function to save power. The CK-30 has a capacity of 30 lbs x 0.005 lbs. This gives the scale the precision you need to help maximize your profits. We also offer this scale in 60 lb capacity as well. With an easy-to-clean cabinet and detachable plate, the CK-30 scales also feature a built-in serial port for easy PC/printer communication. Attractively designed and tough enough for everyday professional use, these scales will meet virtually every weighing need on almost any counter. Whether you’re selling bananas at a produce stand, pricing ribeyes in a butcher shop, or weighing cheese in a dairy, the CK-30 will provide the reliability you need. So if you need a dependable and substantial scale at a very affordable price, choose the CK-30 from 1800SCALES.com.